Muzaffarnagar and Shamli district, Uttar Pradesh. Relief camps here are still filled with people after riots that occurred a month and a half ago. All of these people are from the Muslim community. The winter has set in, yet the government has made no provision in these camps. Children in these camps are dying from the cold. In Loi camp of Muzaffarpur district, a nine-month-old baby died from the cold on 1 December. The doctors said that he contracted pneumonia because of the cold. On 18 November, a four-year old died here due to the cold. 16 children have died here since the camp was set up. In Malakpur camp, Shamli district, 27 children have died up to now. 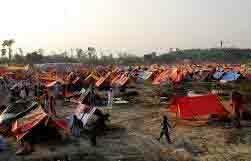 Usman, from Astitva, a local organisation involved in relief work in the camps, said up till now no bonfires have been lit or blankets distributed in the camps by the government. Faizal, who is involved in the relief work in Loi camp, also seconded this. “The state has not yet made any provisions for the cold weather. But some non-governmental groups have distributed blankets and warm clothes.” In Bassikalan camp of Muzaffarnagar district, relief worker Zahoor Hasan said that the worst impact of the cold is faced by children, and especially newborn children fall sick almost continuously. There is no help being provided by the government.